Basically these are special episodes of my Precure fan series it mainly about funny situations. Follow all the regular Rp rules here. Akiko: Kaminari: and Chisame: had just moved in with some of Akiko's relatives and found out they were going to attend Decalo High. 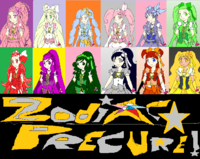 The three girls were members of the Aurakakonian Precure Team Zodiac Precure. The three of them were wearing Wrist-Watch like devices that had Zodiac Symbols engraved on the wristbands. These were their Z-Cators that functioned as watches, communicators, and Portal Generation Devices. They heard that they would be attending Decalo High for at least one semester so they headed out. Akiko: "Bye Uncle Tim and Aunt Jan, thanks for letting Chisame move in with us." Kaminari: "We will be back later." Akiza: *Looks toward Ryan* "I heard that we may be getting three new students soon, but I have no idea if it's true or not." Suiko: *Huffs indignantly. * "They better not be Girls! Ryan Darling is mine!" Akiko, Kaminari, and Chisame arrive at the school gates. They have yet to get their uniforms for this new school, but they need to find out some stuff about it first from the Administration. The three girls had backpacks on their backs with laptops in them. They also had an assortment of Notebooks as well. They couldn't help but wonder who they would be in class with. Their anticipation was high as they entered the gates heading to the main doors. Kaminari: *Snaps her fingers as she remembers something. * "Hey guys, isn't this where some friends of our go? I think we met them about three months ago. I think Chisame made them Portal-Coms." Akiko: *Realizes that her Sister has a point* "I think you're right Nari-Chan. What were their names again?" Chisame: *Thinks for a minute as the three girls head for the School Office. * "Ryan Carbuncle, Akiza Lapis, and Suiko Citron. I seem to remember something else about them too, but this is neither the time nor the place to talk about it." The three girls agreed with Chisame in not pushing the other thing about them at the moment as they entered the office. Administrative Secretary: "Can I help you three ladies?" Akiko: "Um yes you can actually, we are here for an appointment with the director of this school. We're Transfer students from Aurakako, at least for this semester. We are Akiko and Kaminari Denkou and Chisame Genshuku." Administrative Secretary: *Enters names* "I have you registered already, but haven't put you in a room yet. Are you all in the same grade?" Akiza: *ponders something then speaks up right before Suiko goes to her class. * "I've heard a rumor that they're from Aurakako Academy. You don't think?" Suiko: *Huffs* "That better not be the case! Especially with so many of them!" *Heads off to her class with a huff as she sticks her nose up in a snobby fashion. Akiza: *Sighs and rolls her eyes as she sees Suiko take off. * "I told you, it's only three new students." Suiko was too far away to hear what Akiza had to say as Silver remained in Suiko's bag quiet as usual. Valin: Hello Ryan, how are you and your girlfriend? Ryan: She's not my girlfriend! Valin: Sorry my bad I forgot you have 4 girlfriends your getting quite the Harem. Head Master: (Motions for the Zodiac Team to enter his office) "Ladies, you're all three enrolled. You have one week to get your School Uniforms for this school. Also, if you have a school uniform from your previous school you can use those every once in a while. However, make sure you get a uniform for here too. Enjoy your semester. My door is always open." The Zodiac Girls: "Domarigatou Headmaster. Thank you for accepting us." The Zodiac Girls leave the office and are given directions to their room by the Administrative Secretary. The three are advised to get with someone to give a tour of the school as soon as possible. Following the directions they were given, the three Zodiac Girls head to their classroom. They come to the door and knock on it. They have their transfer slips ready. Little do they know that they are in Ryan's class. *Knock on the Classroom door. Akiza looks toward it and then addresses the teacher, "Sensei, I think our new transfer students are here." Akiko: I wonder who are classmates are. Kaminari: "We will just have to wait and find out. I hope it's those nice people we met when we were here before." The Zodiac Girls wait to be let into the classroom. OOC: Headmaster and Gem Flash and Tifa. Who is the first year girl? Ryan: It's that one Karate girl from the School Olympics. Valin: People you know I assume? The three Zodiac Girls enter the classroom, shut the door behind them and write their names on the board. Akiko: *Smiles and waves. * "My name is Akiko Denkou. The three of us just transferred here from Aurakako Academy." Kaminari: *Smiles and waves as well* "My name is Kaminari Denkou, if that's too long of a name to remember, you can call me Nari." Chisame: *Smiles and waves at Akiza and Ryan, then to the rest of the class. * "My name is Chisame Genshuku. We are going to be here with everyone for at least this semester. Akiko and Kaminari have and Aunt and Uncle that live here." The biggest thing that stands out to Ryan, Akiza, and possibly Tifa and Emiko are their different hairstyles and their lack of certain Jewelry they had when they were here before. They were now apparently wearing Wrist-Watch like Devices with some sort of Zodiac Symbols engraved on the wristbands. Akiko looks toward Emiko and can't help but think that her eyes and smile look familiar somehow. Akiza: *Walks up to Akiko, but addresses all three of them. * "Nice to see you three again, we should give you a tour later. I'm not sure if we actually met formally, my name is Akiza Lapis. It's nice to meet you for the first time or possibly again." The three Zodiac Girls were wondering where their seats were. Of course Chisame wanted to sit up front while the Denkou Sisters were happy with either sitting near the middle or in the back. OOC: Tag The Gem Flash Team and the teacher in the classroom. Teacher: let's see for You Chisame you can be up at the front. And the other two sit back there behind Ryan the boy with the funny hair over there. Emiko: Ohhh more friends for your Harem isn't that great Ryan! Akiko: *Can't help but think that Emiko looks familiar with those eyes and her smile. * "Ryan, why does that purple-haired girl look familiar?" Chisame: *Takes notes down with a smile as she waves toward Akiza. * "It's been a while hasn't it Akiza?" OOC: Tag Gem Flash Team. Akiko: *Giggles* "Of course I do. We actually did introduce ourselves to each other. I try to make friends with everyone I meet. That's just the way I am. I make friends quickly, that's why I gave you and your friends those wrist-watch communicators so we could keep in touch. I also know what your extra-curricular activities are." *Giggles. * "So why does she seem so familiar to me? Is there a place where we can share our Extra-Curricular Activities here?" Kaminari: *quietly walks up to Emiko and whispers in her ear. * "Are you who I think you are?" Akiko: *Sits back down in her desk and goes back to taking notes. * 'I think I'm making Ryan nervous. I don't understand why. I just want to be his friend. I wish he would just give my friends and I a chance to get to know him and his friends.' *Passes a note to Emiko* This is what the note reads: "You seem quite familiar to my friends and me. I just can't figure out why. Maybe we could meet in your meeting place after school today. Would love to find out why you seem so familiar to us. Sincerely, Akiko. The Zodiac Girls look around the room and are amazed at all the Cure stories and novelty items they have in the room. Akiko: "Wow, this is a nice set up you guys have here. Can my friends and I join?" Akiza: *Ponders as she thinks to herself. She then nods toward Akiko. * "Welcome to the Cure Club, as President of the Cure Club I welcome you aboard." Chisame: "So, Emiko was it? You really remind me of someone. Why is that. I feel like I know you, but then again I don't." Kaminari: *Looks toward Gold as she switches to her Fairy form Nari. * "Gold, why is it Emiko seems so familiar to us?" Suiko: *has a noticeable twitch in her eyes. * "You three better stay away from Ryan Honey! He's mine!" OOC: Emiko/Pearl, Ryan and the rest of the Gem Flash Team. Heading to bed after I take my medicine good night. Pearl: I'm Pearl That's why! Akiko: *Notices a text that was sent to her yesterday, it's from Amaya* "We are coming to Decalo City with Arina. We should be at the school a little bit later in the day." "What? Arina, Amaya, and Kazumi are coming here today?" Chisame: *hugs Pearl avoiding being smothered in her assets* "You look so beautiful." Having gotten directions to the Cure Club from the Headmaster, Arina: Amaya: and Kazumi: arrive outside the Cure Club and knock on the door. OOC: Ryan, Emiko/Pearl, and company. Amaya, Kazumi, Arina: *Cough* "Can't breathe." Akiko: "Pearl, they can't breathe. You know two of them, but the other one you don't know. Please let everyone go so all of them can introduce or re-introduce themselves." Kaminari: "Maya-Chan, Kaze-Chan, Rina-Chan are you okay?" Chisame: *looks toward Ryan, Gold, Akiza, Suiko, and Silver. * "Has Pearl always been this affectionate as a human?" Suiko: *Glares at Pearl* "Hey Pearl, control your own strength, let them breathe! Hmph!" Amaya and Kazumi: "Pearl?! You became Human?!" Arina smiles and runs excitedly up to the front of the room. Arina: Hey everybody my name is Princess Arina Luna Amaterasu of Climatopia, but here I'm just Arina Amaterasu, also known as Cure Virgo. It's nice to meet everybody. I guess you all know that I was evil for a while. I'm also a Sophomore while Amaya is a Junior and Kazumi is a Senior." Akiza: "Nice to meet you Arina, my name is Akiza Lapis also known as Cure Sapphire." Suiko: *Hmphs and sighs at the prospect of another girl after Ryan. * "It's nice to meet you I guess, my name is Suiko Citron also known as Cure Topaz. As for Big Bust over there, well I will let her tell you about herself." Silver: *Deciding to speak for the first time in a while. * "My name is Silver, I'm one of the GemFlash Fairies. It's also nice to see you again Nari and Kaze." OOC: Ryan, Emiko/Pearl, Gold, and the rest. Pearl: Big bust? What do you mean Suiko? Kazumi: *Looks toward Arina and smiles. * "Oh come on Rina-Chan, she's just happy to see you. Nari-Chan, Umi-Chan, and me were also worried about you. Even Chisame, Akiko, Kasumi, and Sayomi were worried about you." Akiko: "I agree with Kaze-chan, we were all worried about you." Kaminari: "I agree too, Kaze-Chan, Maya-Chan, Umi-Chan and me were all worried about you. We are glad to have you back Rina-Chan!" Arina: "I'm glad to be back Nari-Chan." *Smiles and hugs the currently human Fairies and her big sister. I'm so glad I met all of you." Chisame: "Now our team is complete." *Then remembers something. * "As for the other three members of our team, they stayed behind to protect Aurakako." Akiza: "Well Arina, Amaya, and Kazumi welcome to the Precure Club! Glad to have you aboard." Amaya and Kazumi continue to stare at Pearl/Emiko they can't believe how beautiful she turned out. Suiko: *Huffs at the prospect of more girls vying for Ryan's attention but pushes it to the back of her mind. * "Akiza, I think we may need a bigger Club Room." OOC: Ryan, Pearl/Emiko, Gold and anyone else in the Cure Club Room. Akiza: "Um yeah, we got a new member of the Club while you were gone." Eilliot: What? What's wrong with two boys showing their friendship? Gold: This is Eilliot the newest to our team. The Zodiac Girls get up and gasp. Akiko: "Wait a minute, another male cure? I thought one was rare, but two? My name is Akiko Denkou. Cure Leo is my other name." Chisame: "So is he just like you are Ryan?" *Chisame is trying to process this info. * "My name is Chisame Genshuku also known as Cure Libra." Kaminari: *Is still taken aback, but speaks up anyway. * "The name is Kaminari Denkou, you can call me Nari if you want to. I'm also known as Cure Gemini as well as the Zodiac Fairy Nari." Amaya: *Equally taken aback, but pushes it into the back of her mind and speaks up shyly. * "My name is Amaya Amaterasu, a-also known as Cure Aries." Kazumi: *Realizes that Elliot is a guy now, but isn't too surprised, for the longest time she disguised herself as one. * "The name is Kazumi Denkou, you can just call me Kaze if you want to. I'm also known as Cure Taurus." Amaya then notices that Elliot is dressed like a girl along with the rest of the Zodiac Girls. Amaya is about to say something but chickens out as she looks at her sister, the outgoing one of the group. Arina gets the message and blurts out the question. Arina: Elliot why are you dressed as a girl? Akiko, Kaminari, Chisame, and Kazumi are wondering the same thing. Amaya is wondering the same thing, but referred to her sister because she was afraid she would offend someone. Eilliot: Dressed like a girl? I'm not these is perfectly normal clothes for a guy. Gold: You see Eilliot is from the Gem Kingdom his species genders are swapped the guys are more feminine while the females you get the idea, so to him Girls clothes are guys clothes. Akiko and the rest of the Zodiac Girls nod in understanding. Amaya gets over her shyness finally and speaks up about her true origins. Amaya: "Rina-Chan, Nari-Chan, Kaze-Chan, and our other Fairy Umi-Chan aren't from around here. We are actually from the kingdom of Climatopia, which is currently under the rule of the evil Queen Ophiuchus." Arina: "Eilliot, I was captured and corrupted into fighting my sister and her friends for four years. It took Akiko and her friends being found for me to come to my senses. After that, all nine of us went through various trials to get upgrades to our Cure Powers. We will show you our Cure forms sometime if you want to see them." Akiko: "Nari-Chan, Kaze-Chan would you like to show our new friend your Fairy forms?" Nari: "My name is Nari in this form, oddly enough Nari is short for Kaminari so you can call me Nari as well as Kaminari." Kaze: "My name is Kaze in this form. Just like Nari is short for Kaminari, Kaze is short for Kazumi, so it's okay if you call me either Kaze or Kazumi." Chisame: "You see, Arina and Amaya are Princesses of the Kingdom Climatopia. The job of the Zodiac Precure team is to defeat the Eclipse Kingdom and their evil Queen Queen Ophiuchus to free Climatopia from the clutches of the Eclipse Kingdom. Oddly enough, there really haven't been any attacks in Aurakako lately so hopefully Kasumi, Narumi, and Sayomi can defend Aurakako for a while in order for the six of us to attend school here." Akiza: *Jotting down everything the Zodiac team says in her Precure notebook. * "Wow, and I would love to see your new Cure forms sometime wouldn't you Ryan, Gold, Pearl, Suiko, Silver, Eilliot?"